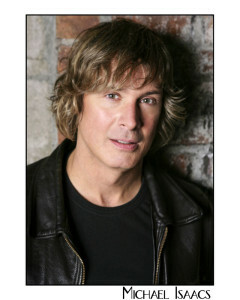 Michael Isaacs is MAC nominated singer, songwriter, musician and actor who is based in NYC. Originally from New England, Michael attended Berklee College Of Music and then went right to work in the clubs of Boston and Providence. Moving down the coast, his first performance in NYC was at the world famous Apollo Theater in Harlem. The performance went so well, he was featured on “It’s Showtime At The Apollo” two times. Michael has performed in so many clubs in NYC it would take up a whole page to list them. He has sung and played piano and guitar in many cabaret shows and is very proud of his work with System Noise in the MAC nominated “The Rise And Fall Of Ziggy Stardust” and his most recent show solo show “Isaacs Schmisaacs” a Nilsson show. Throughout Michael’s career he has had the opportunity and pleasure to open for Roberta Flack, Jose Feliciano, Bobby Short, Ronnie Spector and Neil Sedaka. He was also prevliged to sing two duets with Neil, at Neils request, with Michael on the piano. Truly a highlight of his life. Recently Michael was selected from a Nationwide search and was featured as a principle in 5 national commercials for the Florida-based company Steinmart. Michael plays many instruments and is currently working in his own recording studio on his debut cd. Proud member of the Screen Actor’s Guild/AFTRA.